A classic and charming timepiece by Olivia Burton. A chic floral patterned dial is presented in sophisticated grey and lilac tones, with silver shade hour indexes and three hands. An IP gunmetal steel case encapsulates this beauty, finished with a mesh ionic plated gunmetal steel bracelet. 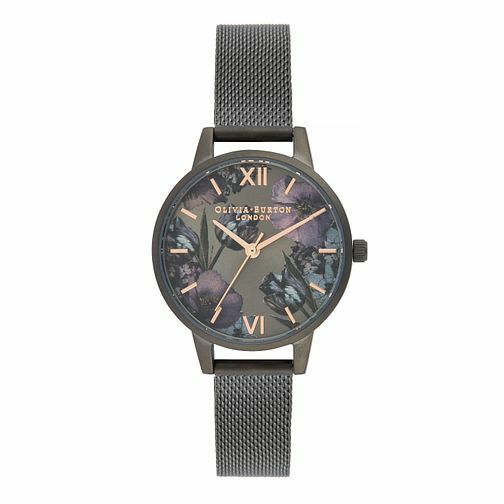 Olivia Burton Twilight Ladies' IP Gunmetal Bracelet Watch is rated 5.0 out of 5 by 1. Rated 5 out of 5 by Anonymous from Lovely watch. Great price and delivery in time for Christmas Very nice watch that pretty but understated. Intricate design with an easy to read clock face. Unique colors as well.